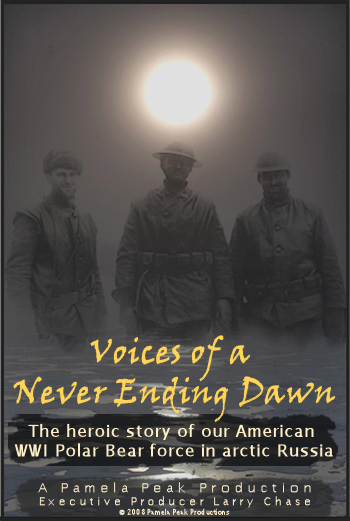 Voices of a Never Ending Dawn - the story of the American North Russia Expeditionary Force "Polar Bears" is now available on DVD. Expeditionary Force and made motion pictures documenting their activities during their time in North Russia. Canada's National Film Board has archived the Canadian Expeditionary Force WW I film footage and has made it available for viewing on-line at their "Images of a Forgotten War" web site. 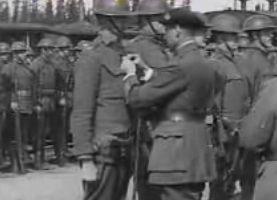 Their North Russia footage totals more than 40 minutes and is presented in four parts: With General Ironside's Forces in North Russia 1, With General Ironside's Forces in North Russia 2, With General Ironside's Forces in North Russia 3 and With General Ironside's Forces in North Russia 4. "The Polar Bear Expedition: The Heroes of America’s Forgotten Invasion of Russia, 1918-1919" by James C. Nelson, is available here at Amazon.com . In the brutally cold winter of 1919, 5,000 Americans battled the Red Army 600 miles north of Moscow. We have forgotten. Russia has not. "The Struggle for Russia's Revival in the Northern Region", by Brian Dimler, is available at Lulu.com . This book is a first-hand memoir of the White Russian experience in the North during the Russian civil war. "FUGITIVE MOMENT: The True Story of an Unsung Hero", by Phil Penningroth, available in Kindle Edition only at Amazon.com. "Look Inside". FUGITIVE MOMENT is a "novel history" that tells the true story of Louis Penningroth, a YMCA War Prisoners Aid Representative, who defied both the United States government and his YMCA superiors in order to negotiate the freedom of American and British prisoners of war in Bolshevik Russia. 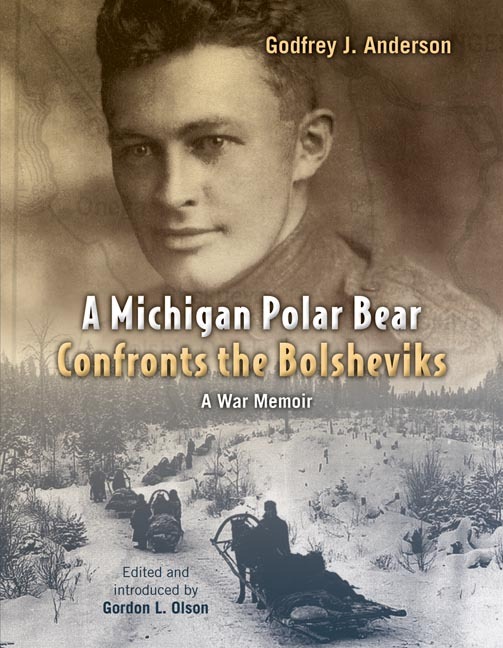 "A Michigan Polar Bear Confronts the Bolsheviks: A War Memoir", published by the Wm. B. Eerdmans Publishing Company, 2010. Edited by Gordon Olson. This book contains the graphic war memoirs of Godfrey Anderson (1895–1981), who was a member of the 337th Field Hospital Company. He tells of his travels by ship and train to Archangel, Russia, where his unit provided medical care for the men of the American North Russia Expeditionary Force. Anderson's unit set up field hospitals in the vast Arctic wilderness, endured the bitter cold of winter and the ravages of the Spanish flu, rubbed shoulders with Russian villagers and rescued scores of wounded from the advancing Bolsheviks in a harrowing nighttime retreat by sleigh from Shenkursk. Olson's book has been recognized as a 2011 Michigan Notable Book by the Library of Michigan. A Well-Kept Secret: The Allied Invasion of North Russia, 1918-1919 , by William Ward. The genesis of this book was the author's Masters Thesis, which was written in the late 1970s and just recently published. It consists almost exclusively of interviews and diaries of men who were in North Russia in 1918-1919, most of whom had never been interviewed before. The hardcover version of his book can be purchased here for $39.99. A download version is also available for $9.99. A short preview is provided that includes the names of those whose interviews and diaries were used in the book. 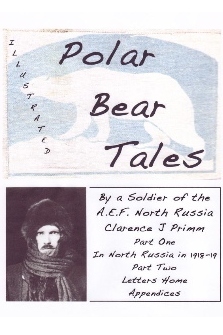 Polar Bear Tales, By a Soldier of the A.E.F. North Russia, Clarence J Primm, edited by Carol Primm and Pete Stuntz. This illustrated, 228 page book of Primm's own reports of his experiences in North Russia has been compiled and edited by his daughter-in-law, Carol Primm of Ocala, Fla. and family friend Dr. Edgar C. "Pete" Stuntz of Manitowoc, Wisc. Clarence Primm was a First Lieutenant in Company M of the 339th Infantry Regiment which saw action on both the Railroad and Pinega Fronts. He describes not only the military actions but also the geopolitical importance of the Allied campaign in North Russia as well as the daily relationships between the American troops and the local residents. Lt. Primm remained in Archangel until the end of September 1919 and provides a first-hand account of events that took place after the American forces had departed. The book is available in PDF format on a CD, which can be purchased for $15.00 USD (price includes shipping within USA). To order, mail a personal check or money order to "Polar Bear Tales", c/o Edgar C. Stuntz, 1806 Grand Ave #31, Manitowoc, WI 54220-6356. Checks should be made out to "Polar Bear Tales, c/o Edgar C. Stuntz". Please include your address and allow four weeks for delivery. Russian Sideshow, America's Undeclared War, 1918-1920, by Robert L. Willett. In August 1918, as the carnage of World War I continued, President Woodrow Wilson deployed U.S. troops to join other Allied forces in civil war-ravaged Russia. Ostensibly a mission to guard tsarist military supplies and the Trans-Siberian Railroad, the true purpose of the Allied intervention was to help topple the nascent Bolshevik government. Dispatched to some of the most remote regions of the Russian wilderness -- from the frigid port city of Archangel to Lake Baikal to Vladivostok -- the U.S. troops encountered fierce resistance from Red Army units, partisans, and peasants. The author, whose wife's uncle (Pvt. G.C. Bahr, Co. M, 339th Inf.) died in March 1919 from influenza, conducted years of research for this book, including visits to Archangel, Murmansk, Vladivostok and Khabarovsk. This book covers both the AEF North Russia and the AEF Siberia and may be ordered by visiting the author's website. View the Index and an excerpt of Chapter 1 at Google Print. The History of The American Expedition Fighting the Bolsheviki, by Capt. Joel R. Moore, Lt. Harry H. Mead and Lt. Lewis E. Jahns, who had been officers in the 339th Infantry. This book has been reprinted in July 2003 by The Battery Press, P.O.Box 198885, Nashville, TN 37219, e-mail: batterybks@aol.com . Orders can be placed on their website or by e-mail. This is a limited edition reprint of 300 copies. The reprinted version is bound with a cover similar to the original but with the 339th Infantry Crest added on a rich brown cloth with black panels and gold type. The book contains 360 pages, 120 photos and 1 map, in a 6" by 9" hardcover format and costs $59.95 Originally published in September of 1920 with a press run of 2,000 copies, this rare history covers the activities of the 339th Infantry Regiment and its attached units from entry into North Russia in September 1918 until its withdrawal in August 1919. Operating under British command, the Americans were split up in isolated detachments protecting the vital railroads and rivers which supplied the Russian units fighting the Reds. There are chapters on all aspects of the campaign, including the many small operations performed under arduous conditions. Also provided is a list of decorations and an Honor Roll of American killed in action. A paperback edition of this book has been published and is available for $9.99 at Amazon.com ($0.99 for the Kindle version). This book is also available for free in various electronic formats at Project Gutenberg. It has has been transcribed by Don Kostuch, the son of John Kostuch, who was a Mechanic in Company M of the 339th Infantry Regiment. From this page, you can select any of several formats to read and/or download the book at no cost (all but the ".txt" format include the original photos). The original edition of this book has been digitized by Google Books and can be viewed/downloaded here. You can also read the transcribed version of this book on "Scribd" by clicking here. "M" Company - 339th Infantry in North Russia, by Capt. Joel R. Moore. Self-published in 1920. Moore was "M" Company's Captain and he wrote this 69 page hard-covered book for his men. It describes the major battles fought by Company M and includes numerous reminiscences and photographs. Also included is the Company Roster and the Company Diary. This book has been digitized by Google Books and can be viewed/downloaded here. Forgotten Valour: The Story of Arthur Sullivan VC, by Peter Quinlivian. Published by New Holland (Australia) in September 2006, ISBN 1741104866, 304 pages, including photographs, maps, bibliography and index. AUD$29.95 suggested retail price. The book is published in Australia and international buyers can contact the publisher through their website at www.newholland.com.au. Arthur Sullivan was one of about 150 Australian soldiers who volunteered to join the North Russian Relief Force in 1919. This book explores the political and military paths, as well as the personal stories of a number of key participants, which led Arthur Sullivan to win the Victoria Cross on the Dvina River Front in August 1919, nine months after the Armistice ended the First World War, in a little known phase of Australian history. It goes on to explore the experiences of returned men generally, and Arthur Sullivan's short but eventful life. Victoria's Cross - Anzac to Archangel, The Story of Sgt. Sam Pearse, VC, MM, by Mike Irwin, The Sunnyland Press Pty. Ltd., Red Cliffs, Victoria, Australia, Nov. 2003, ISBN 1876709499, 144 pages. This book may be ordered directly by . Price including shipping: AUD$50 or AUD$65 (soft or hard cover). This is the story of Samuel George Pearse, who was born in Wales, U.K. and as a young teenager, emigrated with his parents to Australia. In 1915, Sam enlisted in the Australian Imperial Force and saw action at Gallipoli,Turkey and in France. Following hospitalization and discharge from the AIF while in England, he enlisted in the British North Russian Relief Force in July 1919 and married an Englishwoman shortly before shipping out to North Russia. The NRRF's objective was to relieve the departing American Forces and evacuate all remaining British Forces before winter set in. Mike Irwin recounts the NRRF's campaign against the Bolsheviks, the heroics of Sgt. Pearse at Emptsa on the Railroad Front and the long and determined search conducted by Pearse's daughter, Victoria, to learn more about the father she never knew. 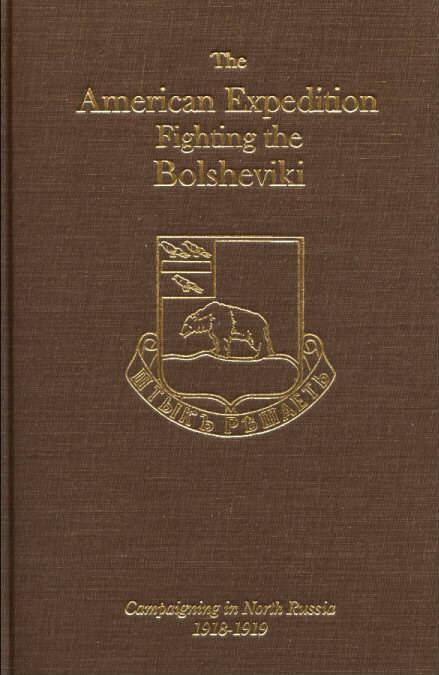 Fighting the Bolsheviks: the Russian War Memoir of PFC Donald Carey by Donald Carey, Edited by Neil G. Carey, Presidio Press, Novato, Ca. ; ISBN: 0-89141-631-5, 1997, (hardcover, 240 pages, $24.95 - out of print, limited availability new and used from $20.00). Pvt.1/c Carey was a member of Company E, 339th Infantry Regiment and his son has edited his father's daily record and recollections of his wartime experiences to create this book. "Detroit's Own Polar Bears", The American North Russian Expeditionary Forces, 1918-1919, Stanley J. Bozich and Jon R. Bozich, Polar Bear Publishing Co., Frankenmuth, MI, 1985 (softcover, 176 pages). The authors use text and photos to tell the story of the roughly 5,000 World War One American soldiers who trained at Camp Custer, Michigan, where they were known as "Detroit's Own". In July 1918, they were shipped to England and eventually to Archangel, North Russia, where they were deployed to several fronts where they fought the Bolshevik enemy while under British command. During their return to the United States in June 1919, they began calling themselves "Polar Bears". This book also contains many interesting photos of uniforms, weapons and gear worn and used by the "Polar Bears", but unfortunately, it has been out of print for a number of years. 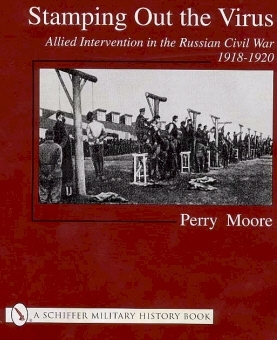 Stamping out the Virus: Allied Intervention in the Russian Civil War 1918-1920, by Perry Moore, Hardcover, 300 pgs., $35.00, Publisher: Schiffer Publishing, Ltd., Oct. 2002, ISBN 0764316257. Quartered in Hell: The Story of the American North Russian Expeditionary Force 1918-1919, by Dennis Gordon (Editor), Paperback: 320 pages, Publisher: Gordon, Otoupalik, and Schultz (G.O.S. ), (January 1982), ISBN: 0942258002. The author's objective was to allow the veterans of the American North Russia Expeditionary Force the means with which to relate their experiences in the snow trenches of Russia. This book contains a lot of new material, some of it submitted by the veterans themselves, which the author obtained over the course of three and one-half years of correspondence and interviews. Find out more about this book at Amazon.com. Intervention in Russia 1918 - 1920 - A Cautionary Tale, by Miles Hudson, Hardcover: 224 pages, Publisher: Pen and Sword (April 2004), ISBN: 184415033X. The authors' father served in Archangel in 1919 and this book covers the whole intervention effort, North, East, South and West. Churchill and the Archangel Fiasco: November 1918-July 1919, by Michael Kettle, Routledge, 1992 ISBN 0415082862, 9780415082860; 582 pages. Archangel: The American War with Russia, by A Chronicler (John Cudahy), A.C. McClurg & Co., Chicago, IL, 1924, 216 pgs. Stillborn Crusade: The Tragic Failure of Western Intervention in the Russian Civil War 1918-1920, by Ilya Somin, Transaction Publishers (August 1, 1996), ISBN 1560002743, Hardcover, 236 pages, $34.95. The Romance of Company "A," 339th Infantry, A. N. R. E. F., by Dorothea York, Detroit: McIntyre Printing Co., 1923, 156 pgs. This book has been scanned by Ancestry.com and can be read on-line by their subscribers. Snow Trenches, by Daniel H. Steele, A. C. McClurg & Co. Chicago, IL, l931, 361 pgs. With Ironside in North Russia, by Andrew Soutar, Hutchinson & Co., London, 1940 ; Ayer Company Publishers, 1970. This page created and maintained by Mike Grobbel. VISITORS SINCE JULY 6, 2002.